For patients who spend long stretches of time in bed, pressure sores can develop without the use of a proper pressurerelieving mattress. The Systam Viscoflex Evolutive Pressure Relief Memory Foam Mattress is the most enhanced mattress in the Systam Viscoflex range, featuring unrivalled levels of comfort, stability and protection. This advanced engineering has made the Viscoflex Evolutive suitable for patients at very high risk of developing pressure ulcers. This mattress is an upgraded version of the Systam Viscoflex Mattress. The outstanding pressure relief levels that this mattress provides can be attributed to the intelligently positioned specialist foam inserts across key areas. This allows for more comfort and pressure relief than ever before, as problem areas for the development of pressure sores are catered to. The varying levels of firmness provided by these inserts in zonal areas allow for more support than other pressure relieving mattresses. 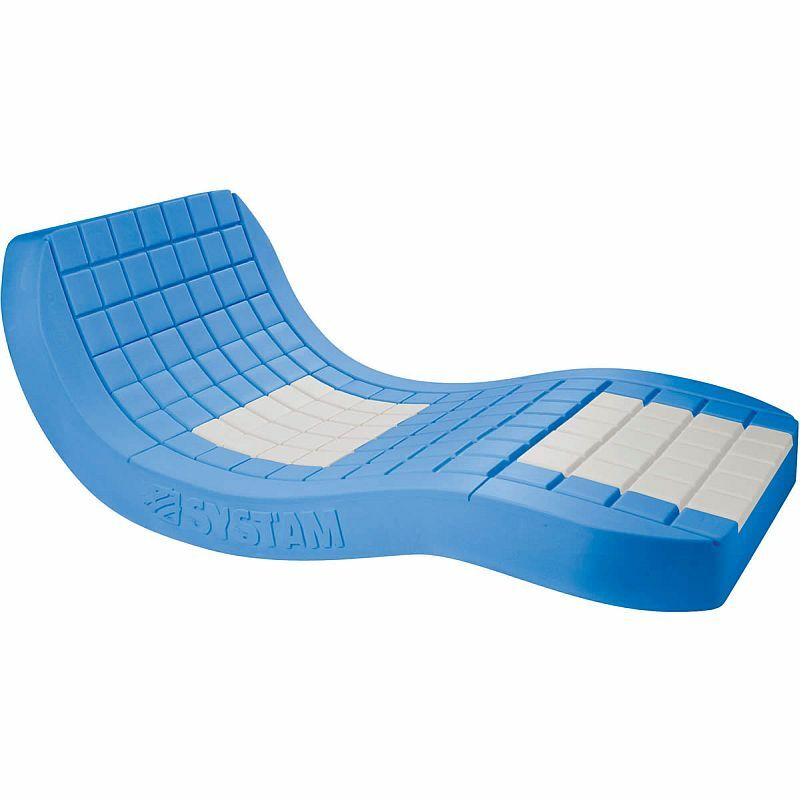 While many pressure relief mattresses are suited to only a certain type of patient, the Visco Foam used in this mattress automatically moulds to the shape of the user's body, providing a personalised pressure relief experience every time. This foam is specially designed to provide excellent pressure distribution, reducing trans-cutaneous pressure while improving circulation. This memory foam effect improves the overall comfort of the mattress, while boosting its pressure relieving properties. This mattress is equipped with a high resiliency foam core made with Visco Foam to provide comfort and prevent a sagging effect in the centre. This Visco Foam is anatomically shaped, resulting in better support of the sacrum area which increases the contact surface area with the mattress. The increased surface area contributes to a reduction in the maximum pressure felt by the patient and the prevention of sacral-region pressure sores.